LEXINGTON, Dec. 16, 1950 -- A record-breaking crowd of 13,000 sang Christmas carols at the halftime intermission here tonight. 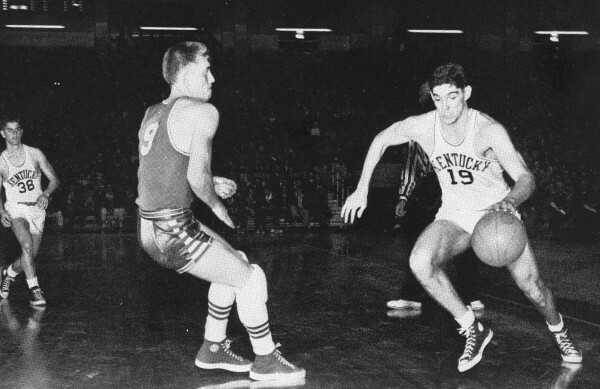 And when they left Memorial Coliseum after Kentucky had staggered Kansas, 68-39, they caroled the praises of the Wildcat's Bill Spivey. 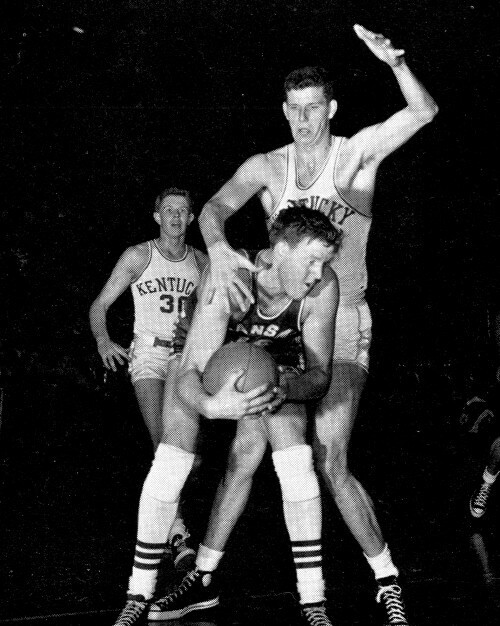 For Spivey emerged from this "battle of the giants" with Kansas' Clyde Lovellette as a truly big man in basketball in more ways than simply height. And the Wildcats as a whole showed they potentially are one of basketball's great teams in handing the No. 4-ranked nationally Jayhawks their first loss in five starts. Spivey, a demon on defense and a back-breaker on offense, left no doubt as to who was the big man on the floor tonight. The 7-foot one-inch Georgian outscored the 6-foot 9-inch Lovellette, 22 points to 10; and, perhaps more important, he stuck to the Kansas star like glue. His defensive game was one of the most exciting and effective ever turned in by a Wildcat. Kansas was destroyed during a flaming five-minute assault by Kentucky that began midway of the first half with the Wildcats ahead, 8-5. After this siege, the Cats possessed a commanding 20-6 lead. And this was increased to 16 points at the half, 28-12. Kentucky extended even this lead, to 64-33, as substitutes carried on in the last seven minutes. During the first half, to demonstrate the tremendous effort of Spivey, the Wildcat giant scored 14 points while Lovellette was tallying four. What's more, Spivey guarded the Kansan so masterfully that the Jayhawks had a most troublesome time attempting to feed Lovellette the ball. On 11 occasions, Spivey thrust his hand out and deflected the ball away from Lovellette. Lovellette fouled out in the second half with more than 13 minutes left. When he left the game, Coach Adolph Rupp also benched Spivey for the remainder of the game. At this point, Spivey owned 22 points and Lovellette 10. The tall Kansan tried hard and had tough luck with his shots in the first half. He dunked three quick buckets early in the second half and seemed to have found the range, but he soon fouled out. Spivey, of course, wasn't the whole show tonight as the Wildcats notched their fifth triumph against no defeats this season and their 88th straight on the home floor. There was sophomore Frank Ramsey, who accumulated 19 points, a number of them in the clutches, and turned in a top performance on the floor and boards. There was Shelby Linville, whose forceful rebounding allowed Kentucky to get the ball away from the Jayhawks, who like to play a slow, deliberate game; what's more, Linville tabbed eight points. 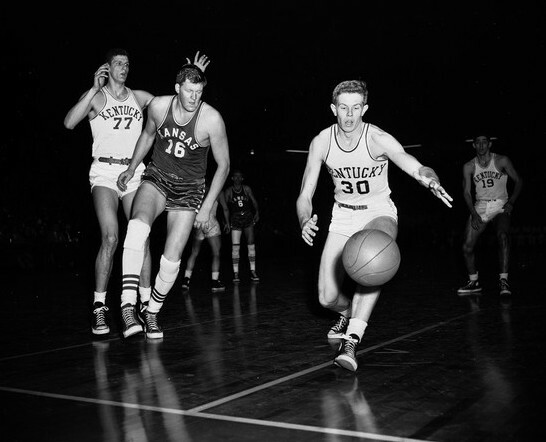 There was Walter Hirsch, the Kentucky captain, who directed his teammates with confidence and was the Wildcat who fed the ball into Spivey. Kentucky connected on 30 of 94 shots for a percentage of 31.9 before the biggest crowd ever to see a regularly scheduled season's game in the state. Kansas fired 62 times and could hit on just 14 shots for 22.5 percent as Kentucky demonstrated one of its finest defensive games. 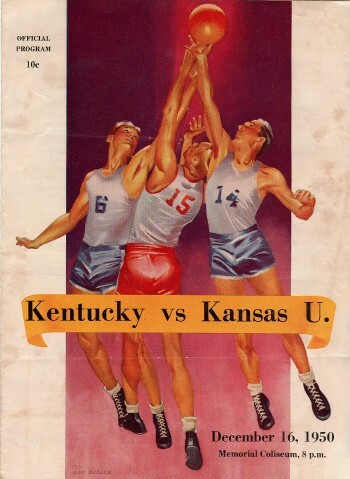 Kansas rarely had time to get set for a shot; it didn't have the speed, either, to match UK and so hard pressed, it found itself having difficult in attempting to set up its plays. Spivey attempted 16 shots and cashed in on nine, a percentage of 56.3. Lovellette tried 17 shots, completed four for 24.5 percent. Someone asked Rupp after the game why he pulled Spivey when Lovellette left on fouls. "We wanted the playing time to be exactly even -- we wanted it just that way," he responded. "We had a commanding lead, too." Kentucky and Kansas fought on even terms for the first 10 minutes of the opening half, and the battle of the giants -- Spivey and Lovellette -- was a defensive one. They were on each other like glue, with neither able to get many good shots at the basket. So, midway of this half, Kentucky led, 8-5. Both teams fired erratically, but both were pressed by the tight defense of the opposition. Kentucky got its fast break working during a flaming five minutes that ensued. Ramsey cut loose with two buckets. Then Spivey found the range, too, with his hooks and spins, and he connected on three straight buckets. On the first, he stole the ball from Lovellette under the Kansas basket. Breaking loose from the surprised pack, Spivey dribbled the length of the floor and scored in the clear. Ramsey came back with another basket on a crip. By now, Kentucky had constructed a 14-point lead these torrid five minutes and was ahead, 20-6. This margin was boosted to 16 at the half -- 28-12. Spivey had accounted for 14 points and Ramsey eight. Lovellette had four points on two fielders and two free throws. Spivey and Hirsch hit to open the second half, and Kentucky increased its advantage to 20 points -- 32-12. However, Lovellette began to operate, and with him chipping in three field goals, Kansas narrowed the UK lead to 3 6-21. But Kentucky retaliated with Ramsey and Linville scoring buckets and Spivey accumulating two more, too. This boosted Kentucky to 44-21, and then Kansas got a tough break. Lovellette fouled out with 13 minutes 33 seconds of playing time left. Frank Ramsey (#30) grabs the ball in front of Kansas center Clyde Lovellette while Bill Spivey (#77) looks on.